Got small spaces? Then you know that it can often be quite difficult to justify taking up so much space to install a traditional garage door opener. 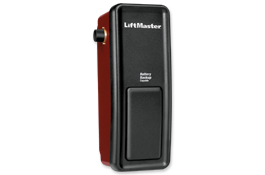 With LiftMaster’s Wall Mount garage door opener you’ll get an opener that provides powerful performance without having to sacrifice storage space. MyQ® Technology affords you the opportunity to monitor as well as operate your garage door from virtually anywhere in the world. As long as you’re able to connect to the internet via your smartphone, tablet or laptop, you’re able to remotely monitor your garage door and opener. (MyQ mobile app required for smartphone and tablet access). With LiftMaster’s P3 motor, you can enjoy all of the conveniences brought about by performance that is both powerful and reliable. Not to mention ultra-quiet; this makes it the perfect companion to a garage door that is adjacent to a bedroom or other living space. Remote light with adjustable light time delay delivers 200 watts of light. Alert-2-Close provides audible and visual warning signals when the garage door is about ready to close when using MyQ technology or Timer-to-Close features. Power Lock Deadbolt ensures that no one can force the garage door open.